The Witch Bonney is a statue of a woman with her arms outstretched on a rectangular tomb. Her hands clutch a veil that falls down behind her body as though it were a sheet billowing in the wind. Her eyes are holes staring at the sky. Under her left eye, a black tear stains through the greening tarnish. Her dress is toga-style and its folds fall off both shoulders, exposing the upper parts of each breast. The fabric falls at an angle where one could mistake its level of exposure. The legend as told by the local high school students is that her dress gets lower and lower starting each October until, finally, her breasts are fully exposed on October 31st. However, given the Wiccans who leave offerings regularly and congregate there each Halloween, this probably would have been corroborated by witnesses. Other legends include a fellow statue as her guardian, a lion tombstone just in the line of her gaze, and also a tale of her rebirth in a tree. Groundskeepers trim all potential resurrection places nearby. 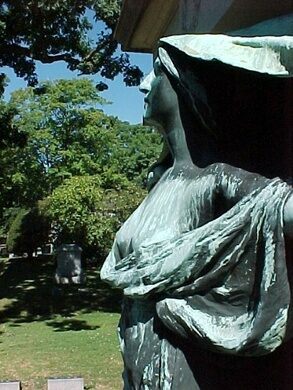 The Lowell Cemetery, home to the Witch Bonney statue, is itself modeled after its more famous sister, the Mt. Auburn Cemetery in Cambridge, MA. It was dedicated in 1841 and designed by George P. Worcester. Its grounds are worth a look not just because of the infamous Witch Bonney, but also because it contains a unique collection of curious gravestones as well as pleasant walking spaces. The Kerouac 5K, an annual short race in Lowell, MA, runs through the cemetery each fall. The Witch Bonney’s gravestone contradicts her own origin stories. While local storytellers explain that she was a Mill Girl employed by Lowell’s Industrial Revolution era Boott Mills, or that she was a witch who was hanged during the Salem witch trials craze, her marker indicates the names of the entire Bonney family: two women and two men, the last name, Clara Bonney, wife of Charles Bonney. Rectangles in the earth to the right of the plot are marked with all their initials. This deters neither paranormal experts who measure inexplicably high electro-magnetic fields around the statue nor the generations of teenagers frightened, and delighted, by the mysterious Witch Bonney. The Witch Bonney Statue is located on Bonney Avenue in the southeast section of Lowell Cemetery. From the Kapp Avenue entrance take a right on Belvidere Avenue and follow it down until it bears left onto Bonney Avenue.